training. 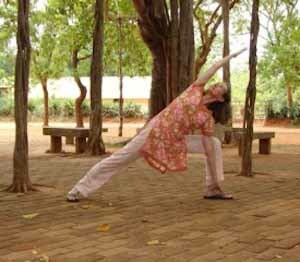 In addition, she is a Yoga Alliance registered teacher at the E-RYT 500 level. biomechanical alignmenttechniques with empowering and spiritually uplifting heart virtues that support a total awakening and harmony of body, mind, and spirit. Her primary teachers have been Anusara founder John Friend, Ashaya Founder Todd Norian, Charly Pivert, Desiree Rumbaugh, Noah Maze, Martin Kirk and Darren Rhodes. As a seasoned professional Jane has an experienced knowledge of the body, a humble attitude and a willingness to serve her students. biomechanics, and the art of teaching. Barb has practiced Yoga for 12 years and is a graduate of the Iyengar Style, Esther Vexler Yoga School (EVYS) here in San Antonio. Introduced to Gentle Yoga by Jane Goldstein and Nancy Sorenson, she then assisted Esther Vexler in teaching a group of older adults as part of her practicum and fell in love with Gentle Yoga. She has attended workshops at Two Hearts in BoomerPlus Yoga Therpeutic Training with Amy Kraft and Chair Yoga presented by H.S. Arun. Barb has furthered her studies by attending workshops at the Yasodhara Ashram in British Columbia. Barb uses a gentle sequence of breathing, stretching, bending and twisting yoga poses to bring about a calming to the body, mind and spirit. Balance, strength, flexibility and toning are added benefits. Her gentle approach utilizing various props will allow a safe and supportive introduction into Yoga for those new to Yoga or for those who also share the love of Gentle Yoga. Physically active all his life, Carl first experienced the amazing power of yoga more than eight years ago when he walked into a gentle yoga class. He immediately recognized that yoga was what mind and body needed and became eager to learn as much as he could. After a few months, he discovered Ashtanga yoga and was amazed at the physical beauty and clarity this vigorous practice offered. Since then, he counts himself lucky to have studied with David Swenson, Robert Boustany, Charly Pivert, Andrew Eppler, Mike Matthews and Kino Macgregor. His current teacher is Lisa Long. Through extensive practice, Carl realized that physical benefits are only a part of the magic of yoga; clarity of thought and calm steadiness of mind which come with the breath leads the student inevitably towards serenity. After attaining teacher certification (RYT 200) Carl started teaching and realized that sharing the joy of the practice was yet another dimension in his deepening love of yoga. Although trained in classical Ashtanga, Carl also teaches vinyasa flow, gentle yoga and acrobatics, having studied with acrobatics champion and coach Vladimir Vladev for the last five years. Please feel free to contact Carl at clobitz2@gmail.com. compassionate. She combines creatively sequenced asana with pranayama and meditation. Her well- earned reputation for balancing humor with the quest for authenticity is truly refreshing, placing emphasis on awareness and creating integrity in the poses that can be carried beyond the mat and into daily life. teaching special needs population including Pre and Postnatal, athletes, ADHD, asthma, COPD, injury/restriction and those who suffer addiction, cancer, joint replacement, PTSD and is sensitive to illness that accompanies each of us as we age. Cristina has been practicing yoga for over 15 years. She received her teacher certification from the Ester Vexler Yoga School in 2015. The decision to enroll in the teacher training program initially was to deepen her personal knowledge and practice of yoga. Never anticipating she would teach, she realized her passion and joy of sharing the gift of yoga. Cristina is a retired R.N. and currently teaches yoga at the Eating Recovery Center in San Antonio. She loves to create gentle and playful yoga sequences with mindful attention to the body, breath, and mind connection. Mindful awareness to the breath with movement encourages students to stay present and aware of the ease and effort within each pose. It is her hope that students can take the practice of yoga off their mats to enrich their daily lives. Please feel free to contact Cristina at cactusflower58@satx.rr.com. 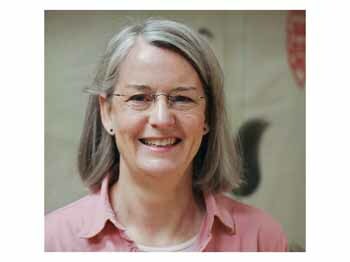 Emilie is a graduate of one of the first yoga schools in Texas, Austin Yoga School, and has been teaching since 1988. Peggy Kelley and Devon Dederich are her respected teachers. 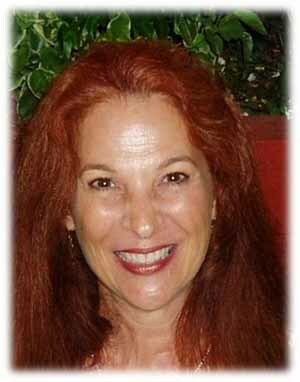 The inspiration for living life well and her yoga career is Esther Vexler. Emilie is Founder of the Esther Vexler Yoga School, the first hatha yoga teacher training program in South Texas. "As an Iyengar Yoga Teacher, I continue my studies with Senior Level North American teachers, and travel to India to attend intensives in Pune, India at the Ramamani Iyengar Yoga Center,and with Sri Arun in Bangalore, India. 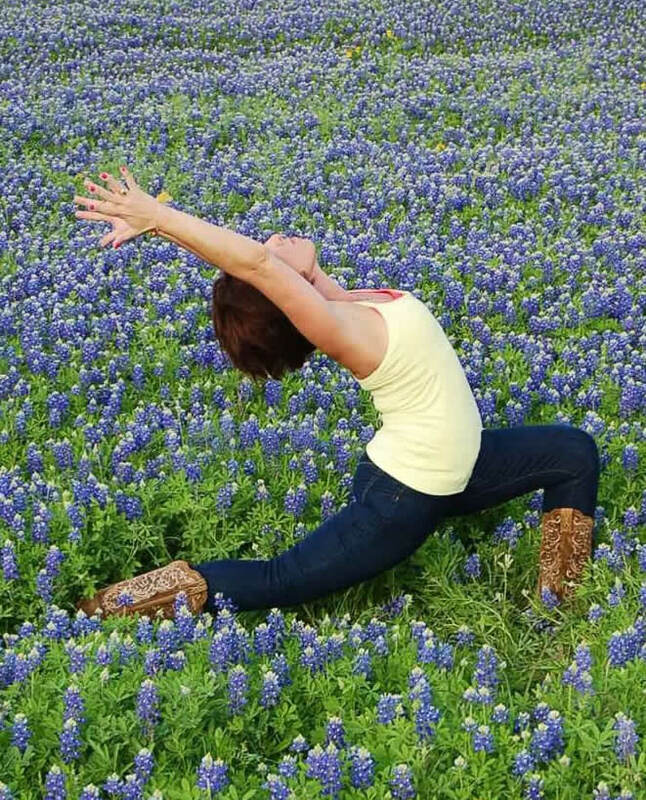 Kitty Bevis is a Certified Hatha Yoga teacher living in the San Antonio area since 2006. Although she has been teaching yoga classes since 1997 she still considers herself a student of Hatha and Bakti Yoga, Sanskrit, and Vedic philosophy. 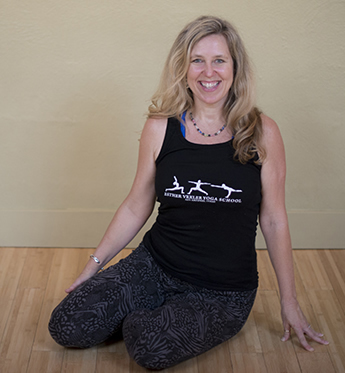 She has studied Alignment and Healing through Iyengar Yoga encompassing Alignment and the Asymmetric Body and the Art of Yoga Therapeutics and Healing with Karin Stephan in Cambridge MA. She has spent additional time studying Yoga for Scoliosis with Debra Woulk. She studies Sanskrit and Yoga Philosophy with Manorama. She successfully completed the Yoga Teacher Training Program at Stillpoint Studios in Tampa FL graduating in 2005. Prior to participating in formal yoga teacher training she was a Certified Group Exercise Instructor and a Certified Fitness Specialist with the YMCA in FL. She is a member of the Suncoast Yoga Teacher Association in FL. Kitty has a deep connection with the kinesthetic and energetic qualities of the physical body and is able to teach the yoga asanas from a unique perspective of creating balance and healing utilizing the mobility her students already posses. She builds upon their strengths and assists them in overcoming limitations both physical and mental. Her classes are fun and stimulating mentally and physically. Kitty shares her living space in San Antonio with a lively bunch of little dogs, a cat, and lots of outdoor feathered friends. When not teaching yoga you might find Kitty sitting quietly at home knitting or reading, preparing meals in her kitchen, tending her garden, or out around town taking yoga classes or singing kirtan. Arielena Reed, Lana, is a Yoga Alliance certified teacher at the E-RYT 200 & RYT 500 level. She founded Wild Thing School of Yoga and she is a photographer specializing in yoga related photography. She studies Alignment Based Vinyasa Yoga & Ashtanga; these styles root her practice and teaching strongly in intelligently-structured flow classes. She is fascinated by each body's beautiful uniqueness and invites you on a journey of awareness to let go of preconceived limitations; to move away from reinforcing deeply ingrained postural habits; to bring ease to places that are over working and to enliven places that are under working. Together, she wants to explore creating a practice that is so completely nourishing, rejuvenating, strengthening and adaptable that it becomes sustainable over your entire lifetime - its resiliency carrying you through life's many transitions and shifts. Most importantly, know that every part of you is welcome in her classes. Join Lana for an adventure of form, mobility, depth, and strength. Lana teaches yoga at various studios around town, leads teacher trainings and is available for privates. Yoga is a natural fit for Marina whose love for exploring different cultures, customs and philosophies lead her to see her practice as a lifelong adventure. Marina's mat is her magic carpet taking her through the changing landscapes of her body, mind and soul. It is from this mat that she hopes to offer encouragement, light and love to each student who also finds themself in a changing landscape. Marina,a Yoga Alliance RYT (Registered Yoga Teacher) with 500 hours, received her training with Todd Norian of Ashaya Yoga and Noah Maze of The Mazé Method. With true joy and energy she teaches adults and children at Two Hearts Yoga. 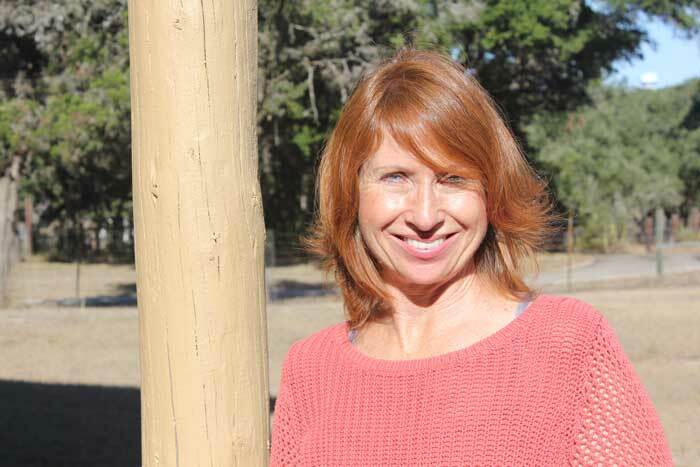 Marina dedicates herself to study, practice and teach Ashaya Yoga, the yoga path of her teachers, Jane Goldstein, owner of Two Hearts Yoga and Todd Norian, Ashaya Yoga founder. Two Hearts is a warm and uplifting yoga studio where each student, new or experienced, will find a welcoming space. Marina's Ashaya classes help each student reconnect through the practice of asana, pranayama and meditation. Please feel free to contact Marina at soulgearyoga@gmail.com or 210-218-1143. Sell, and Jane Goldstein. Nancy began practicing yoga in 1989 with Maria Theresia and Roberto Mazzarrella and completed the Yoga Therapy College teacher training in Houston in 1996. She completed a Yoga Alliance 200 hour certification in February 2002 at Yoga West and an Anusara teacher training with Betsy Dowling in 2005. Nancy completed Sacred Art Teacher Training in June 2010. Nancy discovered her passion for teaching yoga in 1996 when right sized from a corporate position in managed mental healthcare. Nancy began teaching part time in 1997 and was teaching yoga classes full time offering private sessions and leading retreats when she relocated to San Antonio in October 2012. Nancy encourages her students to fine tune their inner awareness, listening and discovering with the body and mind to create health and vitality and presence. Studentsl earn to practice effectively at their own level leaving a class feeling strengthened, refreshed and uplifted. As a lifelong learner and classroom teacher Pamela continues her love of teaching through gentle and restorative yoga classes. Her hope is to build alignment skills and body awareness that create a safe and enjoyable practice. She guides students to awareness of their body, mind, and spirit. Pamela received her yoga certification during Todd Norian Ashaya 200 hour Teacher Training in 2016 and continues to learn through workshops, seminars, and daily practice. 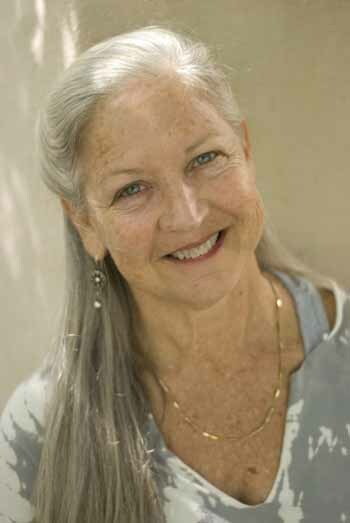 Sandy practiced for more than 20 years, when she decided to study alignment based Hatha yoga at the Esther Vexler Yoga School where she received her 200 hour certificate in 2009. She continues to study Astanga yoga with Beryl Bender Birch and received a 500 hour certificate in 2014. She has trained extensively with Dr. Nydia Darby, a physical therapist, and the late Esther Vexler, the grandmother of yoga in San Antonio, Texas. These two mentors taught Sandy a functional approach to yoga, one where any body is capable of a breath-centered, meditative, movement practice. In 2016, she completed 200 hours with Todd Norian, the founder of Ashaya Yoga. Her mentor, Jane Goldstein, and Todd were instrumental in enriching Sandy's teaching skills to be more heart-centered. Sandy teaches yoga at her studio, Yoga for Me, in Leon Springs. She also teaches adaptive and chair yoga to veterans, students with physical disabilities,and Multiple Sclerosis on a voluntary basis. Join Sandy if you're interested in learning how to use your breath, maintain your strength, gain mobility,and reduce stress. Susie is a native Texan who lives life with enthusiasm, compassion and gratitude. After years as an avid student of yoga, Susie felt the call to teach yoga and received her 200hr certification through the Esther Vexler Yoga School in San Antonio. Susie credits her heartfelt way of teaching to the exceptional teachers with whom she has had the pleasure to study. Susie's classes combine purpose, consciousness, and proper movement to make yoga something special for each of her students. Her classes are energetic yet soothing and always integrate mind, body, and spirit. Her open-minded way of teaching offers participants a unique experience that is inviting and refreshing. Susie feels that yoga should be a personalized journey and that journey will look different for everyone. Susie can often be spotted around town riding her bike, walking her dogs, or practicing yoga outside in out-of-the-way locations. Please feel free to contact Susie at susiestll@yahoo.com or 210-724-7120. Randy began his fitness career in 1982 teaching group exercise in New Braunfels. Moving to San Antonio in 1989, he continued teaching group exercise at the Concord Athletic Club,while working on his license for Massage Therapy in 1995. His knowledge of musculature made becoming a Certified Personal Trainer a natural progression. He earned his CPT from NESTA in 2008, and has worked with a variety of clients. His strong background in massage therapy translates well to functional training and corrective exercise techniques. Kneeling left to right: Cheryl Hamilton, Rosanne White. Members of the Welcome SA Zen Sangha share responsibilities in offering orientation to new participants, leading meditation, and maintaining our meditation space. We have been given training to share our practice with others. 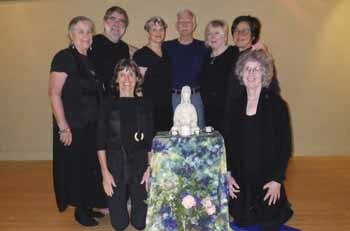 We sit weekly at Two Hearts, including sitting meditation and walking meditation. We welcome newcomers to meditation as well as those who are more experienced practitioners. Please RSVP to welcometosazen@gmail.com by noon each Wednesday to reserve your spot. You may also send questions to this same email. We look forward to welcoming you.